Let's say that there's a huge old cedar, with a huge old branch drooping dangerously low (as in, too low to get the back-hoe underneath, if someone were, say, digging a grave nearby). This is how NOT to deal with the situation. 3. Because the brush is so thick close to the trunk, rest the top end of the ladder 15-20 feet away from the trunk. This will still leave plenty of heavy branch to get rid of. 4. Start up the new chainsaw - lightweight and gas-powered, it is perfect for this job. 5. Send Bert, your favourite backhoe guy up the ladder with the chainsaw. 6. To be extra safe, brace yourself at the bottom of the ladder. You wouldn't want that ladder to slip. 7. Watch as Bert cuts away smaller side branches. Watch as they fall harmlessly to the ground. Admire how well Bert handles the chainsaw. Think just how smoothly this job is going. 8. Watch Bert cut a "V" up underneath the big, fat branch, which weighs as much as a small tree. 9. Watch Bert cut down through the top of the branch. What happens next happens very fast. The part of the branch closest to the tree has now been relieved of a great deal of weight. It bounces straight up, well beyond the reach of the top end of the ladder. This means, of course, that for one odd second the ladder is suspended in midair. And then, gravity calls, and the ladder, Nikki, Bert, and chainsaw (still running) sail through the air. They land in a heap in this order: brambles, ladder, Nikki, Bert... Chainsaw lands some distance away, purring happily. Amazingly, no major damage to anyone - even the ladder survived. I'll let the bruises on my arm blossom fully and then, if I remember, I'll post some technicolour photos. Nothing like a shot of adrenaline to liven up a dreary day of clearing brush. ... but who declared Friday to be poetry day, anyway? Given that reflecting on this poem for the past couple of days was what tipped my hand this morning when the vet was here, thought I'd post it for all to read. The vet was out to do the normal prenatal check-up for my mare, but while he was here, I asked him to have a look at poor, ancient Emma (40, if she was a day) to see whether he agreed that it was time to Let Evening Come. And, indeed, it was. Emma left us while peacefully chewing a mouthful of grass up in the field, her favourite place of all. 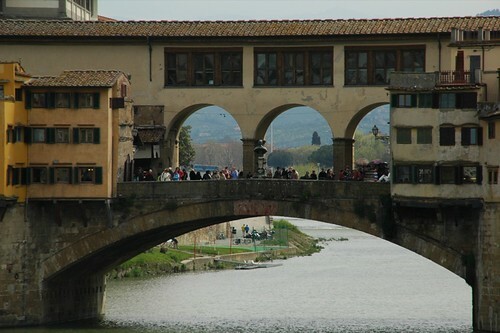 Ponte Vecchio, originally uploaded by nikki_tate. Here we go... a standard issue tourist photo of the Ponte Vecchio... Sigh. Was I really there? When can I go back? 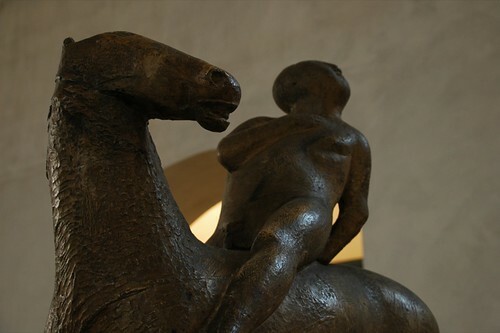 Sculpture by Marino Marini, originally uploaded by nikki_tate. One of various cool pieces of sculpture I drooled over at the Museo Marino Marini in Florence. I have been so very, very bad about not posting recent photos and other stuff to blog, Facebook, or anywhere else for that matter (I blame endless travels and spotty Internet access for this problem). Now that I am finally home again for a bit, I shall try to be a better blogger. Here's the first contribution.